The final whistle: A biography of Sir Bobby Robson. Part Three – England Manager. | NUFC Blog. Sir Bobby: Always in the eye of the media. “Managing England was very different to managing a club. For one thing, it took me two years to adjust to the job. It was lonely. 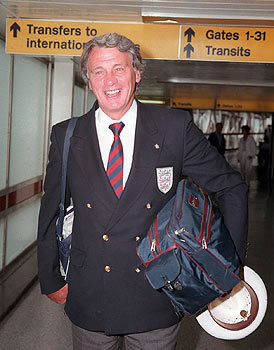 You didn’t see your players for months sometimes and then the chance you had for any coaching work with them was almost non-existent.” Sir Bobby Robson – ‘Farewell but not Goodbye’ 2005. 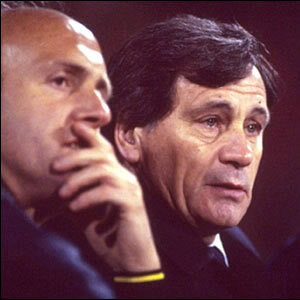 Robson at work with Don Howe, 1982. It wasn’t helped by the following game, a friendly defeat to West Germany at home. After that however, came a run of no less than 13 games unbeaten. But this was to count for little, as the Danes re-entered Robson’s life in a tragedy worthy of Hamlet, when they booted England out of the European Championship finals with a 1-0 victory at Wembley on 21st September 1983. The victory was the result of a highly dubious penalty, given agaist Phil Neal for an alleged handball. It turned out to be Robson’s only defeat in a total of 28 qualifting matches. The press’s vitriol factory was up to full production now, and Robson went so far as to tender his own resignation, however it was rejected by the then chairman of the FA, Bert Millichip. Many speculated that the FA’s fear of their ‘Prince of Darkness’, Brian Clough, was a big factor in keeping Bobby in what was now becoming a very hot seat indeed. One highlight later in this period though (in 1984) was a great victory, albeit a friendly, agains Brazil at the Maracana stadium. England played magnicently, showing glimpses of a very bright future. John Barnes scored one of the most spectular goals ever seen by an English player, which wowed even the Brazilian crowd with it’s dazzling skill. Bobby qualified for the ’86 World Cup in Mexico, with some spectactucular victories, including an 8-0 victory against Turkey in Istanbul, combined with a few less spectalular draws against teams he would have been expected to beat. Bobby later outlined another problem he faced at the time which could have made all the difference in some matches. “Also, for five years when I was manager our best teams were all banned from Europe so the players weren’t getting international experience. It was a disaster for English football. Liverpool, Manchester United, Arsenal . . . not one of them could play in Europe which made it all the harder for their players when it came to England matches. “In all that time only Ray Wilkins, Trevor Francis and Mark Hateley had any international experience because they were actually playing abroad. England struggled initially, and for a while the shoulder of Bobby’s captain, namesake and fellow County Durham man, Bryan, held the nation in it’s thrall. ‘Robson’s Shoulder’ was the Beckham metatarsal of it’s day. A one-nil defeat to Portugal was swiftly followed by a highly disappointing bore draw with Morocco, and things had to change. They did. In the next game against Poland, jug-eared hitman, Gary Lineker, cracked off three goals in the first half. England were through (just) with a mere three points, and the team were working as a unit again. It was two more for Lineker in the next game, with his right hand man, the masterful Peter Beardsley chipping in as well. 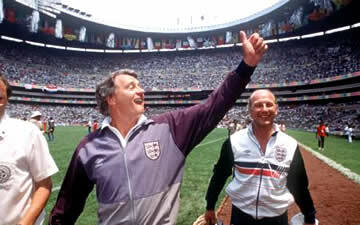 Bobby waves to the England fans at the Azteca. But of course, it is the next game that is most remembered, the Quarter Final with Argentina. It was an incredibly difficult tie. Maradona was on a high, both literally and metaphorically as it turned out, and he was all over the place, striking black terror into the English defence. England held out well, until the 55th minute when Maradona openenly punched the ball past England goalkeeper, Peter Shilton, into the net. 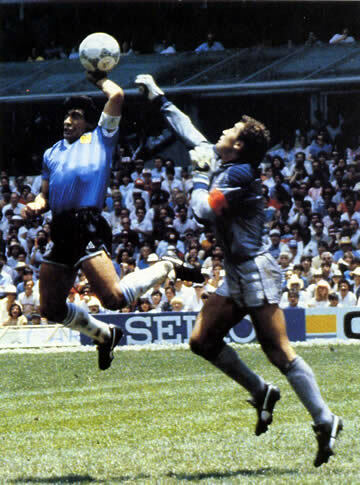 Virtually everyone close to the pitch could see it, apart from the referee, who beleived that a 5′ 5″ Maradona could beat an over six foot goalkeeper (Peter Shilton) in the air without using his hands. The second goal also passed into folklore too, as an Ephedrine fuelled Maradona whizzed through a selection of wilting English players baked half to death in the relentless Mexican sun. It was subsequently voted as FIFA’s ‘World Cup Goal of the Century. England rallied however. An inspired double subsitution, bringing on Barnes and Watford, led to an increased impetus, and Barnes helped the ever reliable Lineker to poke in an opportunistic goal. They almost added an equaliser in the dying moments too. It was not to be however. Argentina, the eventual winners, were simply too strong to overcome in the Mexican heat after the early handicap. No, I’m not a journalist, but I have written professionally on the odd occasion. It’s Bobby Robson not Boris Yeltsin you Dong. Is that Cornelius off planet of the apes? So there is still some life in the old blog yet. Just some Russkies who keep slipping through the spam net, Jason, and always on this post. All gone now until the next time.